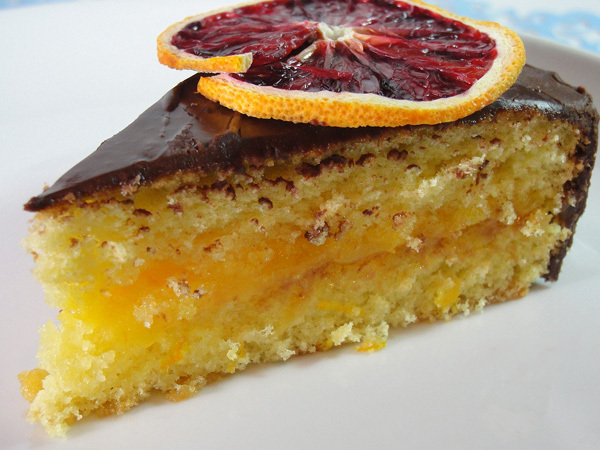 This week heavenly Cake was the True Orange Genoise Cake and boy was everyone looking forward to that one. The buzz on this cake was tremendous. It started with a mad hunt for Seville oranges. You would think that living in the sunshine state; I would have no issues finding this orange, especially since Florida at one time was the main exporter of Sour Oranges to England! (that’s a fact, look it up). But, you would be wrong. It was incredibly hard to find them… specially since we had a couple of weeks with temperatures in the 30’s and 40’s, which means that many orchards/groves lost most of their crops to freezing temperatures. Strike one for the cake! My hunt began by simply calling our local Fresh Market and talking to “someone” in the produce department, who told me that nope, they did not carry it and there was no way to pre-order them either. Next up was Whole Foods, I mean WHOLE-FREAKING-FOODS, if they did not carry those little suckers - the end of the world was near. Me to the produce rep: Wondering if you have Seville Oranges in stock? Produce rep: I’m sorry, Sev.. what? Me [thinking, OH BOY! ]: Seville Oranges or you may know then as Sour Oranges? Produce rep: No, I don’t think so, we have regular oranges, is that what you want? Me: [counting to 10]: no I’m looking for sour oranges, would you be able to order them for me? Me: is there a manager there? Strike two for the cake! Then during a dinner with the future mother in law, I explain what had happen and she promptly told me to give her a couple of minutes, left the room, picked up the phone and the next thing I knew, I had a bucket of sour oranges compliments of a farmer that had some trees in his back yard. The power that woman yields! Point one for the CAKE! Since I have been keeping up with the bakers and all keep writing how delicate the oranges were, I decided to not take any chances and bake it a week earlier than scheduled. Baking the génoise cake was easy and as Rose suggests in the book, I baked it a day earlier. I’m really getting the hang of this new technique of warming the eggs, sugar, and vanilla together before whipping it up to full volume in the mixer. (Previous sponge cakes were done without this pre-cooking step, and I think it just makes a huge difference on the final texture of the cake). 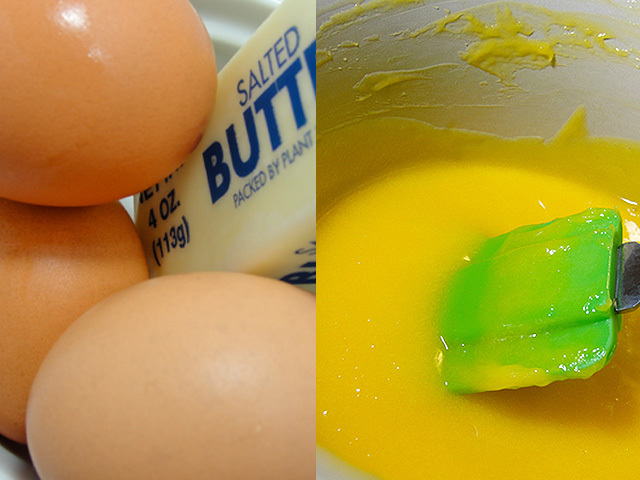 Then, because I was on a roll, I decided to make the orange curd the same day. And this was fairly as simple mixing the orange juice, sugar, eggs, butter and zest together and stirring until it thickened - The hardest part for me was factoring in a whole lot of patience while it cooked over the stove. I hate to wait around for anything – you know that phrase, “good things come to those that wait”, It’s OVERRATED, seeing as, this orange curd took FOREVER (at least in my world) to get to the point that the book said it would be done. You know how boring facing your stove and stirring is? I bet you all do. Because IT WAS THAT BORING to the power of 3! When it was FINALLY done, I put it away and decided to quit while I was ahead and do the syrup and ganache the next day. And those two things went without any major roadblocks. The only thing I did different was not use Triple Sec, but instead used Patron Liqueur Citronge which I happen to have in my liquor cabinet (I’m fancy that way). Putting the cake together was reasonably easy as well. The only doubt I had was not using all of the orange syrup and curd as the book pointed out, my instincts were shouting in the inside to use it all, but again, I followed the instructions, so a continued on…after I hid the left over curd from Tom, who stole a quick taste and wanted to eat it with a spoon. I had a lot of fun covering the cake with the chocolate ganache and I wanted to make sure I did justice to the picture in the book… I was very proud of the way it came out. Very sophisticated and classy looking. But, did it taste as good as it looked? Tom: Oh, this is my favorite so far. The Little man: It’s good, I like the orange flavor, but I like the pineapple one better. My mother: The cake was a bit dry for me (A HA! I knew it! ), but the flavor was good, and by the way can I have the recipe for the orange curd? The Future Mother in Law: I like it but, I would not make it again, the orange flavor is quite strong. Remember my cook fruit with cake anything hindrance? This cake almost made me a believer, mainly because I’m a huge dark chocolate fan, and the dark chocolate combination with the tangy/sweet orange curd was YUMMY! I had to agree with my mother and found the cake was a bit dry and I know it’s because I did not use the whole syrup/curd. My other take would be that while is a beautiful cake and show stopper, it’s also a cake that needs a certain sophisticated palate (not to offend anyone here) to be enjoyed. The majority of people out there would have some reservations to this type of combination (see future mother in law comment above), limiting the pool of people you can served it too. Would I make it again? Only if Tom really, really, begged for it. Plus it looks pretty. As far as the Orange Curd, that has been made twice already. And if you don't believe me, moosy over to Rose Levy Beranbaum site where you can find the recipe.